Vote and Continue to Dream, Carrie Mae Weems. This fall the Museum makes a statement about the importance of participating in the democratic process as a partner in For Freedoms’ The 50 State Initiative. For Freedoms is an artist-led platform for civic engagement, discourse, and direct action for artists in the United States, and the initiative is a network of artists and institutional partners who will produce nationwide public art installations, exhibitions, and local community dialogues in order to inject nuanced, artistic thinking into public discourse. 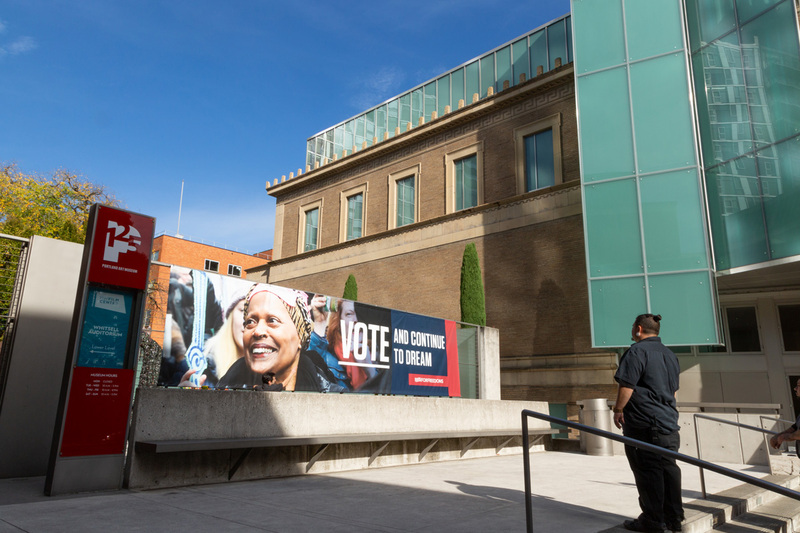 Visitors and passersby will see two artist-created banner installations that use the tools of art and advertising to encourage civic engagement. For Freedoms’ co-founder Hank Willis Thomas dedicates his art to reframing perspectives on difficult issues central to American history and the representation of race and the politics of visual culture. The Museum is proud to be presenting the first major survey exhibition of Thomas’ work in Fall 2019, Hank Willis Thomas: All Things Being Equal…. Learn more about the 50 State Initiative and Hank Willis Thomas from Sara Krajewski (SK), Curator of Modern and Contemporary Art, and Julia Dolan (JD), Curator of Photography below. Why is the Museum participating in the 50 State Initiative? 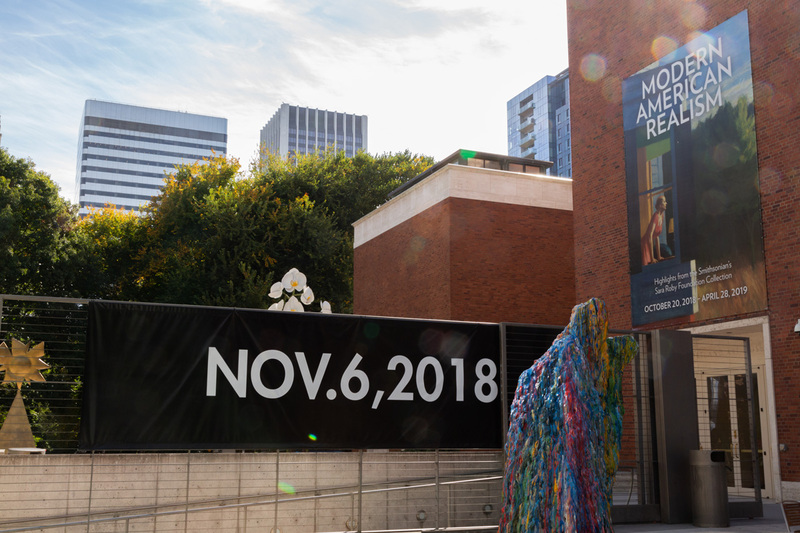 SK: The Museum is one of a number of organizations in Portland (King School Museum of Contemporary Art, Portland State University, and Pacific Northwest College of Art) and Corvallis (Oregon State University) participating in this hugely ambitious project. For Freedoms reached out with an open invitation to engage with them by hosting a billboard, town hall event, or a lawn sign campaign. We definitely wanted to take part to further our working relationship with Hank Willis Thomas. It is a great opportunity for Portland to preview some of his ideas and approaches, as we did with his Truth Booth project in 2016. Also, staff here at the Museum have been thinking about different ways the institution can be a place for civic dialogue and action, and For Freedoms offered some blueprints for stepping into this arena during the midterm election year. Who created the installations that visitors will see on the Museum campus? SK: Carrie Mae Weems created “Vote and Continue to Dream” using a photograph she took at the January 2017 Women’s March in Washington, D.C. The smiling face belongs to the writer and performance poet Sapphire and makes me think back to the great feeling of hope and empowerment the country-wide women’s marches instilled in me and so many others. 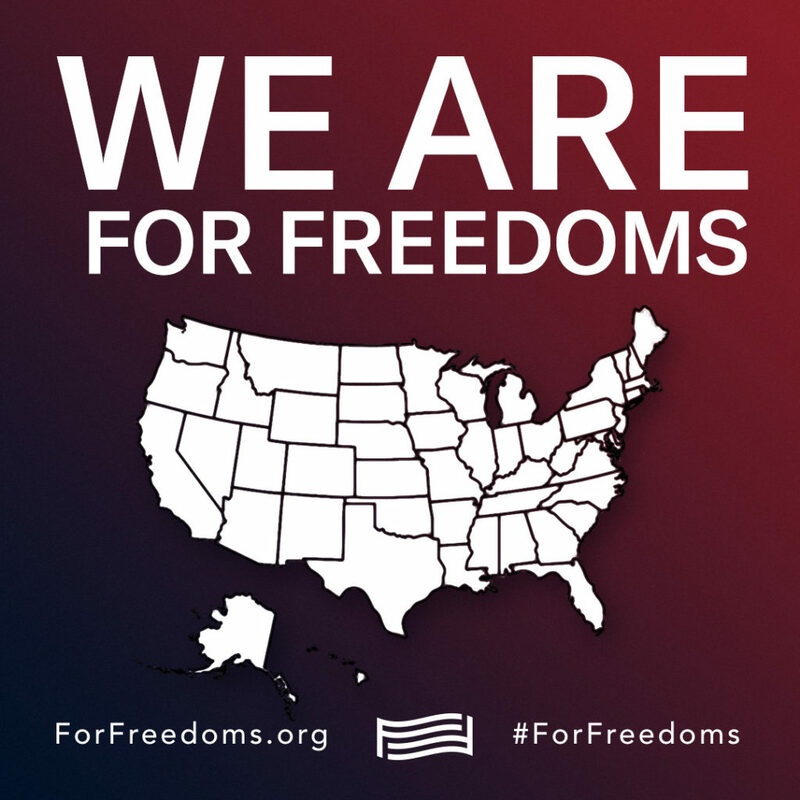 Weems also contributed a billboard image to For Freedoms’ 2016 campaign and is very active in this year’s push. Our banner is presented in collaboration with the Ringling Museum in Sarasota, Florida, that worked with her to realize this piece. Weems is from Portland, so we are excited to have her represented here! The date “November 6, 2018” is the work of Trevor Paglen and is created in the signature style of conceptual artist On Kawara, who was known for his date paintings, works that depicted only the calendar date of the day he painted it. While Kawara’s work is about the present moment fading into the past, Paglen looks into the future with the reminder of this important day on the horizon. His work often examines the invisible structures of data, politics, and economies. This work makes me think of all the systems embedded in an election and how Paglen crystallizes it as a succinct point in time. How do you think that art and photography can play a role in civic discourse? SK: Art often helps us see subjects and issues from different perspectives. For Freedoms positions art as a critical tool that brings complexity and nuance into our polarized political arena. The imagery and ideas are the starting point to instigate respectful dialogue and debate. JD: It is critical that everyone stay vigilant when it comes to photographic messaging. Photography is a powerful language that we “read” all the time without even realizing it. People with different agendas use photography to shape our opinions, encourage us to buy things, and push us to believe a range of facts as well as lies. It is easy to consume the thousands of images we encounter every day without considering who is showing us each image or why. Artists using photography as a civic discourse tool invite us to slow down, look carefully and thoughtfully, and question what messages a single photograph might convey. What questions and conversations do you hope might arise from the installation? SK: We thought our For Freedoms message could best focus on getting out the vote. A direct and simple message right now during the midterms (typically known for low voter turnout): if we have the right to vote, we need to exercise it. If we can talk about the importance of voting in each election and trying to remove barriers to voting, we can emphasize how critical voting is to making sure multiple voices and perspectives are heard, and that elected officials are held accountable to the people. For democracy to succeed, people need to vote. JD: One complicated conversation that might come about involves recognizing the different perspectives that people hold concerning artists and museums delving into the political realm. Even the act of encouraging folks to exercise their right to vote can seem partisan to some. How do we respectfully talk about the roles of artists and cultural institutions as message makers and bearers in this time of heightened political sensitivity and awareness? How does the project relate to the upcoming exhibition Hank Willis Thomas: All Things Being Equal…? SK: Hank is an artist who works in multiple mediums, including collaborative projects. The For Freedoms partnership this fall gives the public a sense of his deeply human-centered approach, grounded in respecting each individual’s voice and seeing each person as a whole being, not a stereotype or an “other.” In his solo work and his collaborations, Hank asks us to reframe our perceptions of race, politics, history, and popular culture so that we can better understand and combat the systems that dehumanize us. JD: As Sara mentions, Hank believes in working with communities and collaborating through the art and ideas he develops side by side with artists, historians, and community activists. He finds meaning in multiple perspectives and wants to improve ties within personal, local, regional, and global communities through open, truthful conversation and action that moves folks forward in positive ways. For Freedoms is a great primer for our 2019 exhibition, which will explore Hank’s collaborative strategies in depth. Carrie Mae Weems’s participation in the For Freedoms 50 State Initiative was supported by The John and Mable Ringling Museum of Art, Sarasota, Florida, State Art Museum of Florida, Florida State University.